A 4-16 record may not exactly jump off the page, but it was the best mark since 2006-07 for the Darien boys basketball team, which has aspirations of solidifying itself as a contender in 2013-14. The path the FCIAC prominence won't be an easy one, but fourth year coach Kyle Marian believes his players are entering the campaign with the correct mindset. "We've got six seniors returning this season, which is great because it's the most the program has returned in a long time," Marian said. "I think our senior leadership is strong. They showed up when the program was in turmoil. The overall experience has changed." Marian and his Blue Wave hope that the positive energy at practice, the return of key players (captain Matt Staubi, Chima Azuonwu, George Phillips, captain Bobby Fitzpatrick and captain Ames Murray, among others), and the small number of players lost to graduation (Brian Wiegand, Liam Naughton and Kyle Green) can translate to more wins. "We're bringing a lot of intensity and energy so far," Murray said. "We've been going since early August, so we're all in good shape at the moment. We're getting plays down and getting ready for the season." "These guys want to be here," Marian said. "These guys have gone from being a team that goes in hoping to win games to being a team that says `look, we can win some games.' That confidence in its own right is a big thing to have." Despite only having four wins in 2012-13, Darien managed to capture the four-team LaVista tournament with wins over Greenwich and Staples, and five of its losses were by eight or fewer points, leading the Blue Wave to believe that success may not be too far away. Marian has named his Opening Night starting five, which is the senior quintet of Staubi at the one, Fitzpatrick at the two, Phillips at the three, Murray at the four and Azuonwu at the five. Colin Sullivan is expected to be the sixth man. 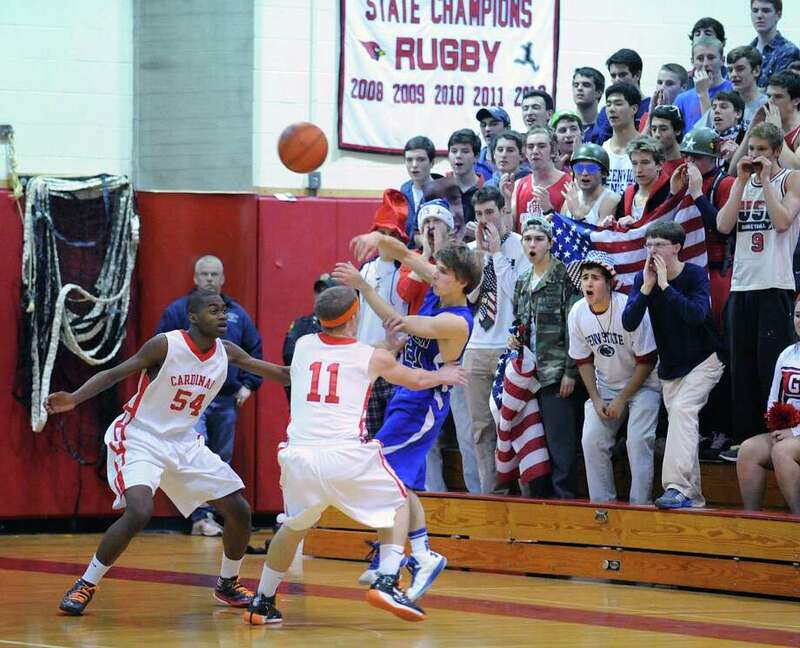 The current Darien varsity roster sounds as if it's embracing the challenge of being the group that puts Darien boys basketball back on the map. According to Staubi, it's not lost on him and his teammates that the boys hoops squad is one of the few Darien High teams that has struggled over the years. "We're almost the only sport here that hasn't won. All our teams seem to be good. So that's the goal and we're setting our mind to it," Staubi said. "We're confident in what we have and we know we've turned the tide, so now it's going out and playing how we want to play." Fitzpatrick believes that the chemistry he and his fellow seniors have built over the past four years should bode well for the upcoming season. "Everyone's up and going, everyone's ready to play, everyone's yelling, everyone's excited. We're just excited for the season," Fitzpatrick said. "We have four seniors who have been playing together for the last four years, and then Matt and Chima the last two years, so we've definitely all formed a good bond and we have good chemistry." Marian has also noted a newfound accountability factor among his players. "They're starting to believe in themselves which is a great thing," Marian said. "For me what's been nice is the past three years I felt like I had to bring the energy every day. This year these guys are bringing the energy and it's one less thing for me to have to sort of demand and control."